Located close to everything you could possibly need, you could hardly find accommodation in a better location than Phachara Suites. Located close to everything you could possibly need, you could hardly find accommodation in a better location than http://www.phacharasuites.com/. Near by you will find popular nightspots, great places to dine, fantastic shopping and easy access to a nearby Skytrain station giving convenient access to the rest of the city. 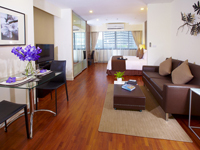 Each and every room is furnished with your absolute comfort in mind. The stylish interiors are very well equipped so you have all that you need at your disposal to make your stay as convenient as possible. With a fitted kitchen, home entertainment system and a high speed internet connection you will be more than happy to stay in alone or in the company of others. With a selection of studios, one bedroom suites and two bedroom suites to choose from we will have something that will suit a range of lifestyles. 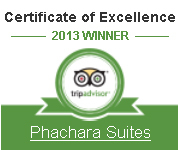 In addition to apartments designed for your comfort and convenience, Phachara Suites has excellent onsite facilities that are available to all guests. A fitness centre will help you to keep in good shape and for a welcome respite from the blazing tropical sun, the pool is a great place to cool down and relax. If you feel like really treating yourself then our Kantawan Spa will leave you feeling refreshed, invigorated and ready for whatever may lay ahead. Phachara Suites is also happy to cater to people doing business in the city and our meeting rooms can accommodate up to 35 people for conferences and business meetings. Whether you are in the city for business or for pleasure, http://www.phacharasuites.com/ will be delighted to welcome you and make your stay a comfortable one. Offering stylish accommodations, the luxurious 194 serviced apartments comprise of studio, one bed room and two bedroom apartments featuring contemporary living rooms, fully equipped kitchens , dedicated work and lounge areas , en suite bedrooms and the comforts of home with technology used to full advantage. Exclusive, intimate and exploding with gold standard services, the staff takes delight in offering the guest flawless service and the genuine home away from home feeling. In true Thai hospitality, we invite you to indulge in a level of excellence designed to meet and exceed your every expectation.